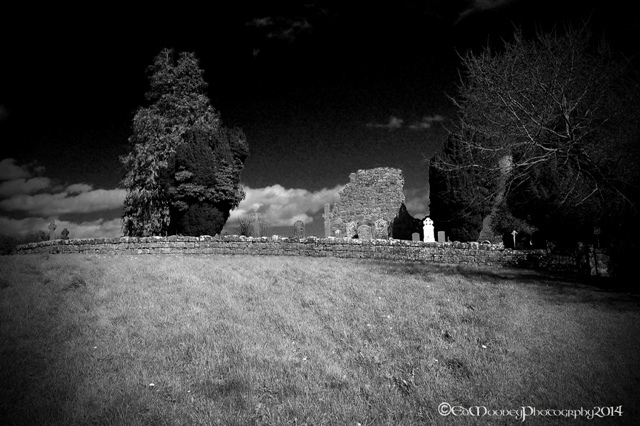 I came across this old church ruin by sheer accident whilst on my recent trip around County Laois. 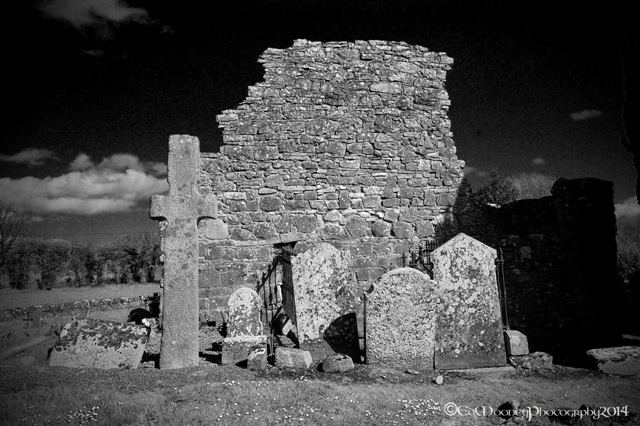 Like so many other church ruins that I have visited over the last few years it appears to be nothing special, ruined churches are a dime a dozen in the Irish countryside. But looks can be deceiving. 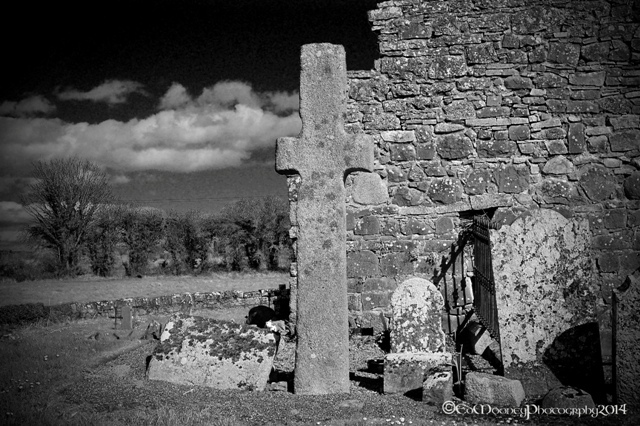 What makes this ruined church different from many others of its kind are not one but two rather interesting granite crosses, which would appear to be from early Christian times in Ireland. A ST. Fiacc is said to have founded a monastery back in the fifth century, at some stage this was moved across the Barrow River to its current location. Unfortunately I could not find an exact date for the church itself. 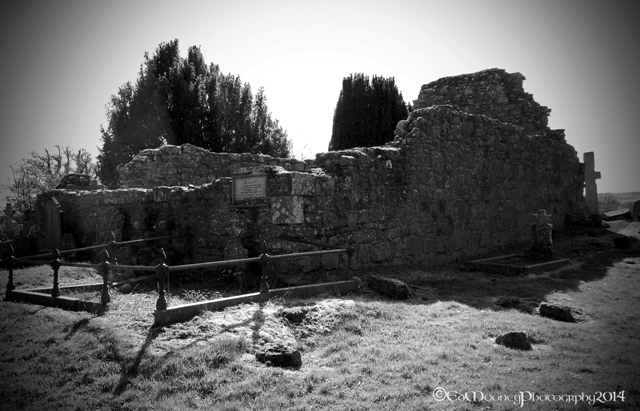 But it was commonly believed to have been the residence of the Bishop of Leinster, which would suggest that it was of significant importance in its day. 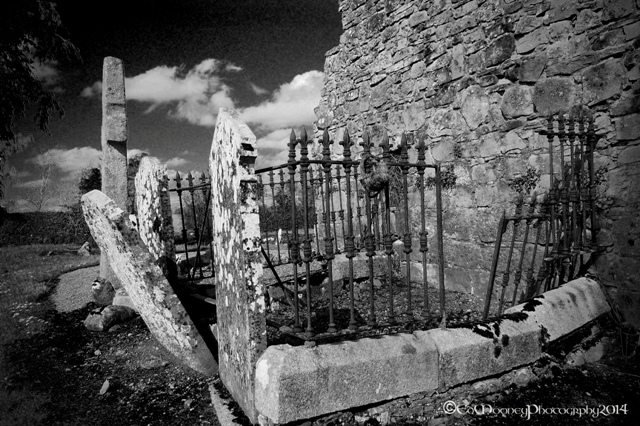 The graveyard which lays a short walk from the roadside is situated on an elevated piece of land, with an almost D shaped boundary wall surrounded by pasture lands and overlooking a stream to the south. Access is had via an old gate or stile in the boundary wall. 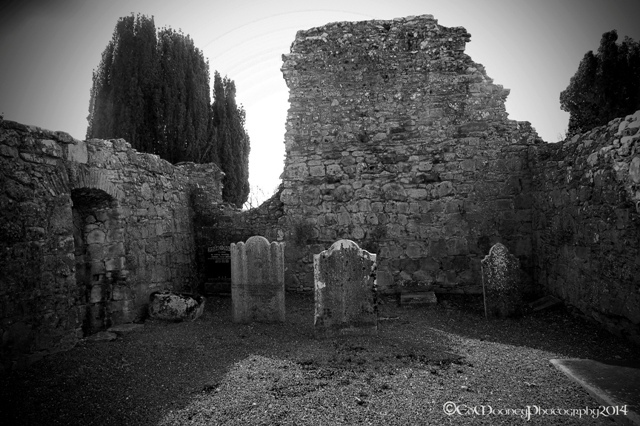 The medieval church sits in the center and is believed to have been the home to Aodh whom was one of St. Patrick’s early biographers during the seventh century. 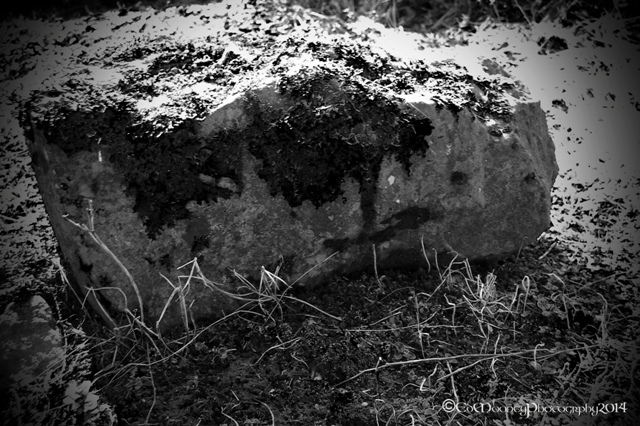 There are many gravestone markers, most of which are overgrown or have been eroded over the centuries and cannot be read. Of the ones that I could read, most postdate the 1700’s. 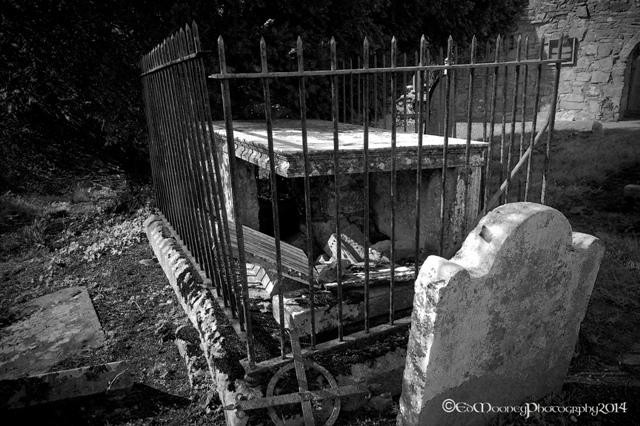 There are also a number of table tombs which are in poor condition. The church itself is about 14m by 9m and is constructed of mainly coursed limestone blocks with the exception of the east gable which seems to have been rebuilt at some stage with sandstone. 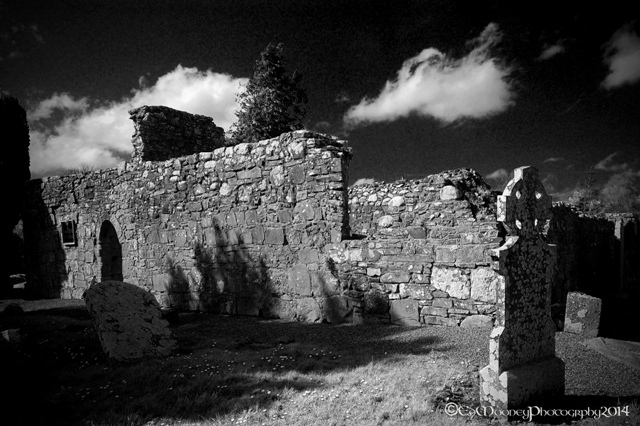 The granite jambs used in its construction may well have been taken from the earlier monastery. 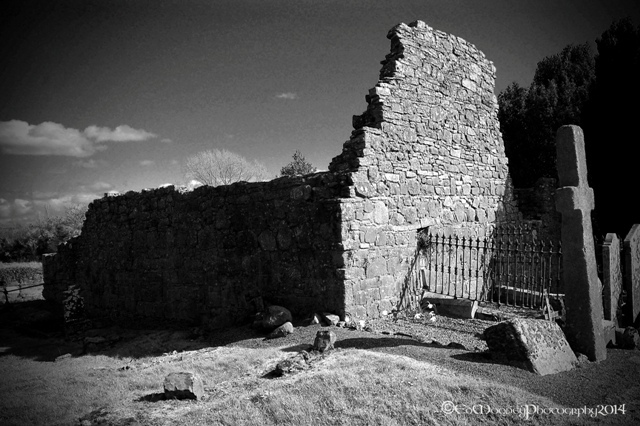 The only features of the church left are a broken window in the east of the south gable and a semi-pointed doorway to the west. 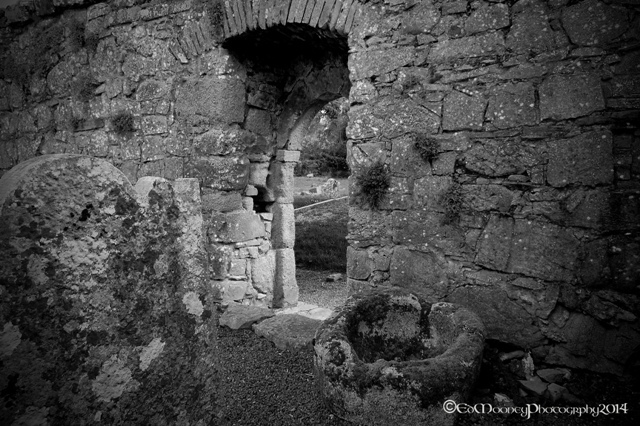 Inside the church near the doorway there is an early Christian font. 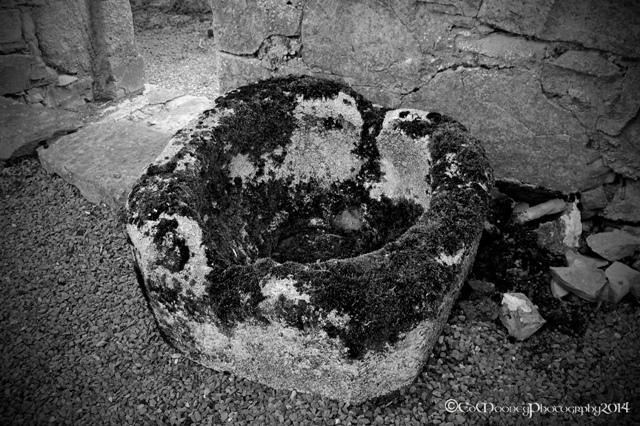 Octagonal in shape, and made from roughly dressed granite. This may also have been recycled from the monastery founded by Fiacc. I did hear about a Holy well associated with the site, but I was unable to trace its location. It was formerly known as Tober-Feeg and may well be stopped up. 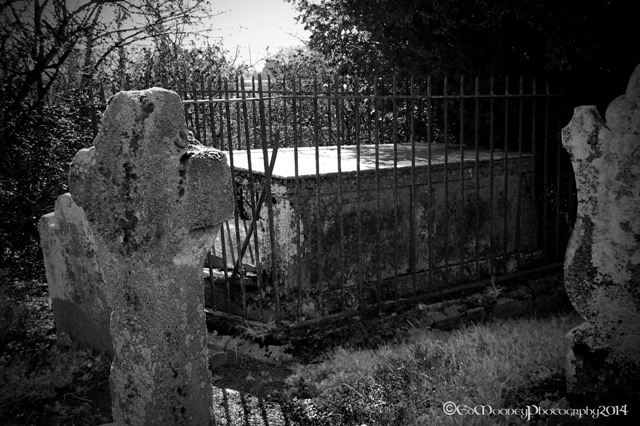 Whilst strolling around the graveyard I almost missed the two Crosses with all the overgrowth, but a careful second scan of the graveyard located them. 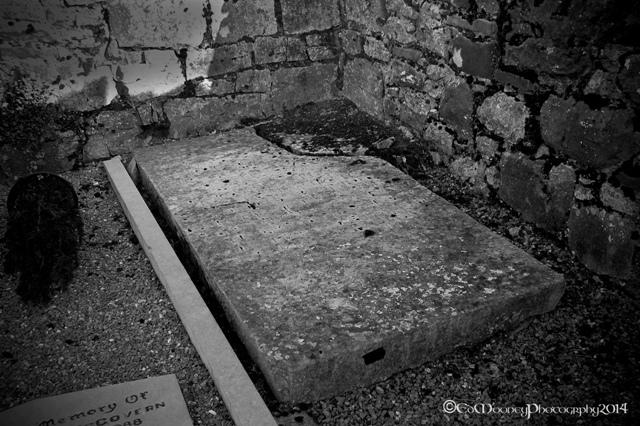 The smaller of the two is just south of the church doorway. I could just barely make out a ringed cross, decorated on its west face, with what looks like a Maltese cross inside it. It is only about 1.5m in height with a raised circle on the east face. 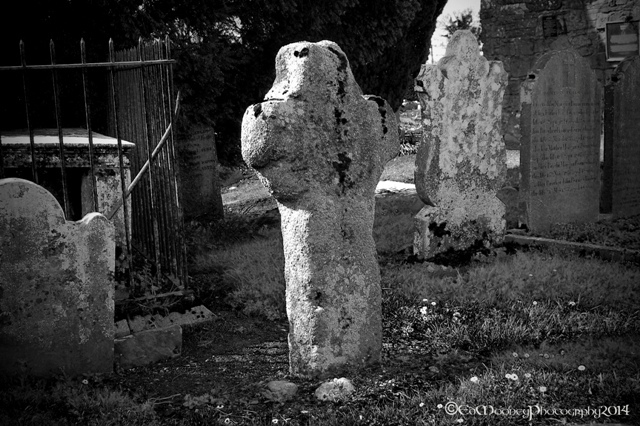 The second cross can be found in the west part of the graveyard. 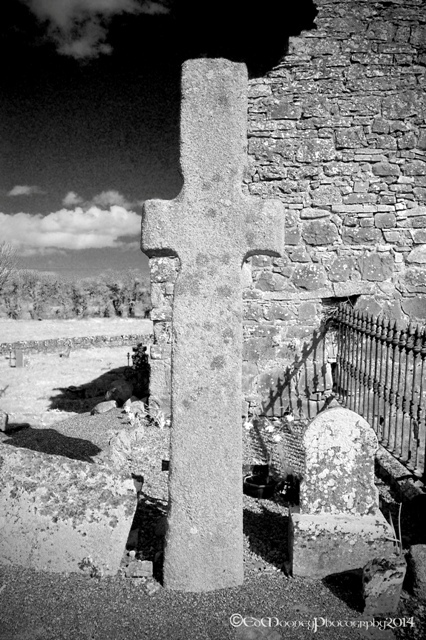 It is a plain, granite cross with cusps and is a fraction taller than its neighbour. When I was leaving I met a nice old couple whom I chatted with briefly. They told me a tale of a local tradition of a souterrainn that lead from a nearby fort to the church. 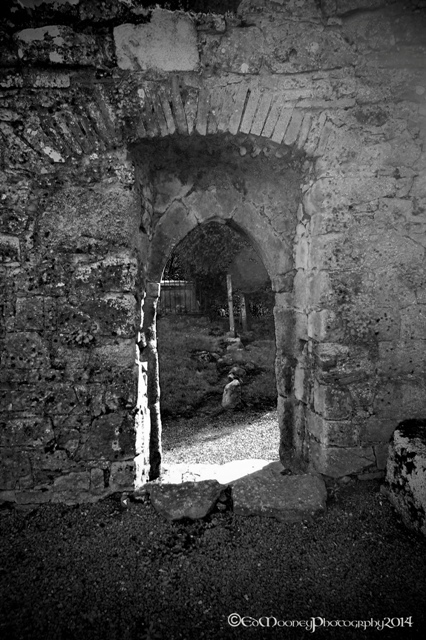 It is believed that Fiacc used this tunnel to travel between the fort and the church any many locals believe that it may still exist? 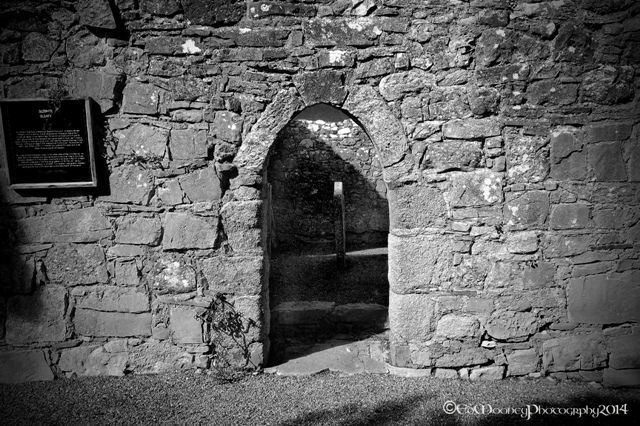 This entry was posted in Diary of a Ruinhunter, Historical, Medieval, Photography, Places of Interest, Religious Sites, Ruins and tagged church, Cross, Ireland, Laois, Medieval, Nikon, photographer, Sleaty, Travel. Bookmark the permalink. 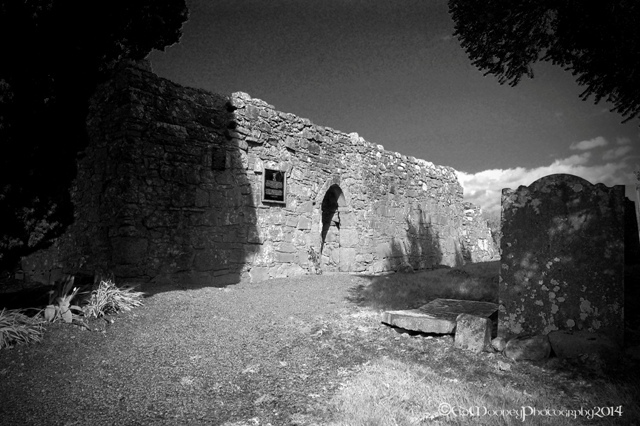 29 Responses to Sleaty, Another Medieval Church…..
Lucky “accident” Ed…As always interesting and great doorway shots. Fascinating shots Ed, but also giving me an Edgar Allan Poe moment with the capsizing tomb. Wow… those are some great shots! I find old architecture fascinating. Considering that many modern buildings are coming apart within a decade or two, seeing these structures that have been there for hundreds of years is really something! Excellent images, of course! And a wonderful historic commentary. 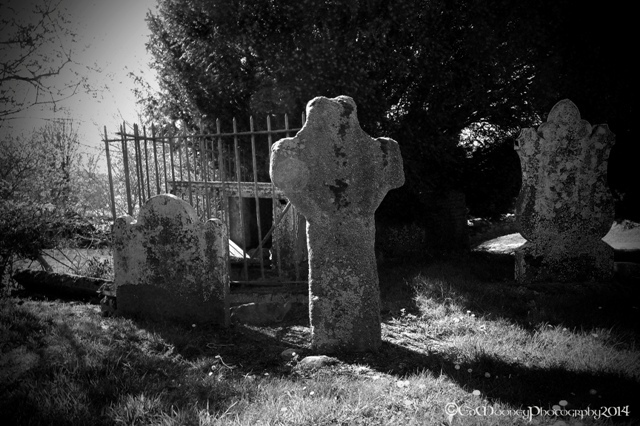 Please keep visiting, photographing and telling stories about them. Hey, that means I can look forward to great pictures and enjoyable stories. Can’t wait for the scary pictures of the tunnel. YIKES, the church shots could be from a horror movies. LOL, I’ll need a radar machine or something to find the tunnel! How amazing to live in a place where you can just find places like this! Beautiful pictures! Heart, heart, heart these shots. Just sayin’. 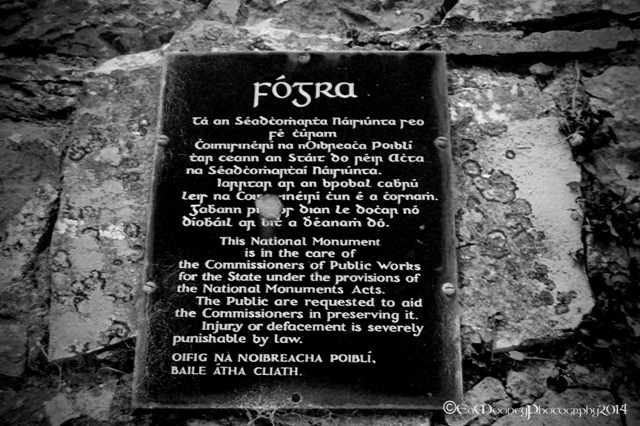 Very detailed and artistic treatment of our local historical monument- Thank you! Hi Ed, these are beautiful photos. I grew up close by, and we were always told the story of the old tunnel. As children, we searched for it to no avail. I know where the Holy Well, Tober Feeg is. It is a little bit away from the monastery, but the belief is that the settlement was much more extensive in St Fiacs time. We brought water from there to use in the 2015 parish celebrations for St Fiac. 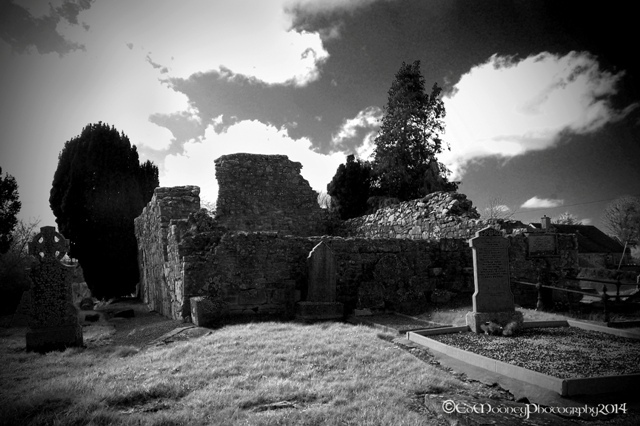 A procession was held from St Clares Church in Graiguecullen to Sleaty Old Church. The old well was believed to have curative powers.